Song of the wild: Sonoma City Opera's first commission in a decade is world-class. Keep a tight hold on your opera glasses. 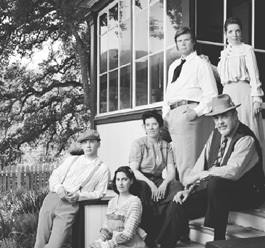 Beginning Nov. 11, this stereotypically staid art form gets a lively update in Every Man Jack, which uses a vaudeville format, a cast of six who perform 50 different roles and everything from a harmonica to a chamber ensemble to present the compelling story of author and adventurer Jack London, his life and times, and his struggle with alcohol. Commissioned by the Sonoma City Opera, this original work is created and performed right here in the North Bay--where London lived and worked--by talented national and international artists. Renowned tenor Rod Gilfry plays the title role. Grammy award-winning composer Libby Larsen and librettist Philip Littell were commissioned to craft this new work for the Sonoma City Opera, to be performed as part of the Green Music Festival. "What I wanted is a palette of the kind of musical world that surrounded Jack London, so that when I created music for London himself, I could create a very human music placing London in the framework of the world in which he lives," Larsen explains by phone from her Southern California home. The bulk of London's writing was completed at the turn of the last century, from the early 1900s to 1916, when he died at age 40. "That particular period of time is a real fascination of mine for many reasons," she says, "most of them having to do with the fact that the world we live in now--which is the world of transportation, roads, music brought to us by electricity and the communications system--were all at the crossroads of their beginnings during Jack London's life." The gramophone was the iPod of its day, Larsen reminds, bringing with it the notion that you could have the world of music at your fingertips in a boxed set of RCA Victor red-seal records. London himself owned a gramophone, and took it with him on his sailing ship, the Snark. "One of the reasons I became so interested in Jack London and the world in which he lived is that it feels very similar to what we're experiencing right now," Larsen says. "It's a world of great change. We don't have many anchors." Based on London's own John Barleycorn, which is as close as London ever came to writing his autobiography, the opera is performed in American English. "What excites me is that by really working with the language itself, we have come up with a piece that is genuinely 21st-century American without any Americana in it. The singers are so excited about the fact that the words and the music have an energy that speaks to us right here, right now. It's in modern language." Such modernism was written by librettist Philip Littell, who created the Sonoma City Opera's first original work, 1996's The Dreamers, an opera detailing the later life of General Mariano G. Vallejo. Speaking to this paper a decade ago, Littell said, "I think that human beings get very big when they're painted very real. The warts-and-all really does give [them] much more stature than the idealized father-of-our-country stuff." With London's vibrant life, of course, Littell had plenty to work from. Larsen explains that the words that Littell penned shaped her melodies. "The music of any culture comes from the language the people speak, both their verbal language and their body language," she says. "That's really what makes Italian opera sound Italian and French opera sound French. American English produces its own music in the rhythms and the shapes of the melodies." It's been a five-year process putting together the highly collaborative new piece, says Antoinette J. Kuhry, artistic director of the Sonoma City Opera. "I think [Every Man Jack] is a really important event because of the level of the artists and because of the subject matter," she says. For Every Man Jack, Sonoma City Opera has brought together Littell, who wrote the libretto for the San Francisco Opera's acclaimed staging of The Dangerous Liaisons and Andre Previn's A Streetcar Named Desire; Larsen, who has created a catalogue of more than 200 works spanning virtually every genre; musical director Mary Chun, who is principal conductor for the San Francisco-based ensemble Earplay; and stage director Joseph Graves, the artistic director of the Beijing Institute of World Theatre and Film in China. Lyric soprano Ilana Davidson is a Grammy winner. This is no regional small-town affair. Pulling this all together on a $400,000 budget takes tremendous effort for this teeny-tiny semiprofessional opera company, says Hillary Costin, executive producer and board president. The company scrimped by such measures as having the artists housed by host families in the Sonoma Valley. "Commissioning an opera on Jack London and hiring the caliber of artists we have hired took Sonoma City Opera out of its comfort zone and into regional and national opera, and international opera," Costin says. "The way we arrived at Every Man Jack was much more in the mode of 'Hey, kids, let's put on a show' and less like a huge opera company which turns to its million-dollar donors." Among other funding, there's a federal grant to bring four Russian opera company directors here to view a rehearsal, speak with the artists and watch one of the shows. Jack London is a popular author in Russia. "We hope that they will be interested enough in Every Man Jack to bring it to their companies in Russia, and that we will continue to have this kind of cultural exchange in Sonoma County," Costin says. She adds, "Everyone who is involved in this is at the peak of their profession. They are professionals, and they are used to dealing with difficult situations. Having them here for six weeks is incredible." 'Every Man Jack' runs Saturday-Sunday, Nov. 11-12 and 18-19 and Wednesday, Nov. 15, at the Sonoma State University's Person Theater. Saturday at 8pm; Sunday at 3pm; Wednesday at 7:30pm. 1801 E. Cotati Ave., Rohnert Park. Opening night admission with reception, $75-$99; other performances, $34-$68. 707.939.8288. Philip Littell appears to discuss the 'Confessions of Jack London' on Monday, Oct. 30, at the Jack London Reading Room of the SSU Library. Noon. Free. 707.664.4240. www.sonomacityopera.org. What could slake Jack's terrible thirst? "By truly heroic perseverance, I finally forced myself to write the daily thousand words without the spur of John Barleycorn. But all the time I wrote I was keenly aware of the craving for a drink. And as soon as the morning's work was done, I was out of the house and away down-town to get my first drink. Merciful goodness!--if John Barleycorn could get sway over me, a non-alcoholic, what must be the suffering of the true alcoholic, battling against the organic demands of his chemistry while those closest to him sympathize little, understand less, and despise and deride him!" "Among the apocryphal legends attached to his name, and founded very possibly on his own statements, was that of his almost superhuman drunkenness. That at one time or another he drank too much I can believe--certainly in all the time of our acquaintance he never showed any sign of it. He was by no means a teetotaler; but I never saw him drunk. Nor did he boast of his drinking prowess in my presence." Rob Loughran's screenplay about Jack and Charmian London, 'Voyage of the Snark,' is in preproduction with the Piper Down Production Company.